5- hour Seminar to get updated on the latest Federal and State Accessibility Codes. Part I: 9:30 a.m. - 12:00 p.m.
Part II: 1:00 - 3:30 p.m. DEADLINE: Registration deadline is June 2, 2011. Participants can attend Part I, Part II, or both Parts. Attendees will receive: Training, A Certificate of Completion, Presentation Materials. 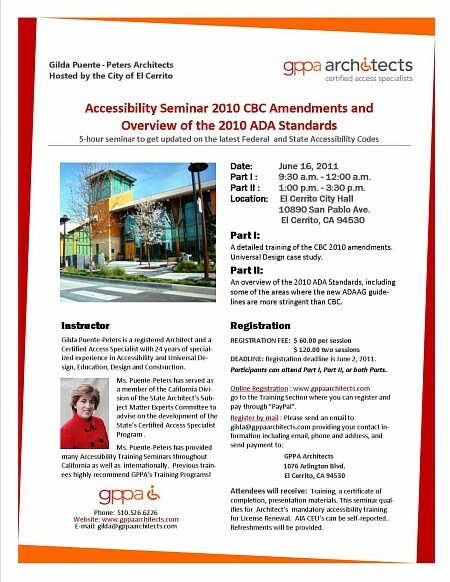 This seminar qualifies for the Architect's mandatory accessibility training for License Renewal.